Excellence may only be achieved by a multidisciplinary approach to patient care. Our Team of Experts consists of a group of highly motivated and experienced physicians, scientists, nurses, technicians, and supporting staff with a common goal of delivering the best care to our patients. In addition, our patients constitute an important part of our team. In fact, our patients have been the best advocates of the program. Dr. Overholt is a gastroenterologist at Gastrointestinal Associates, P.C. (GIA), Founder and Medical Director of Center of Excellence (1988-2011), and managing partner at GIA. He is a graduate of the University of Tennessee Medical School. He did his internship and residency at the University Hospital in Ann Arbor, Michigan. Following this, Dr. Overholt completed a two-year fellowship in gastroenterology at University Hospital in Ann Arbor. 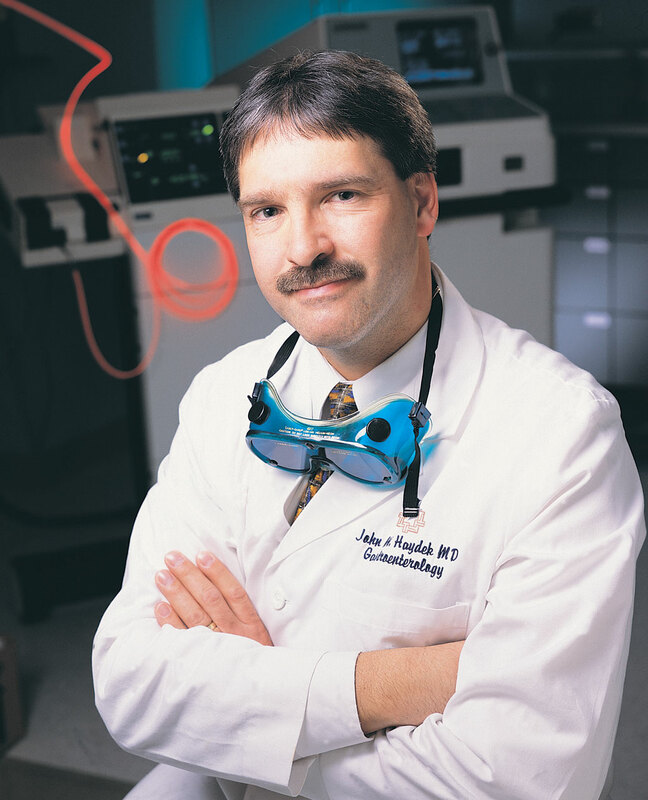 During that time, he served in the Cancer Control Program of the U.S. Public Health Service in order to develop the flexible fibersigmoidoscope/colonoscope. He later received the prestigious Schindler Award from the American Society for Gastrointestinal Endoscopy and the William Beaumont Award of the American Medical Association for this development. Dr. Overholt completed two additional years of training in gastroenterology at New York Hospital-Cornell Medical Center. 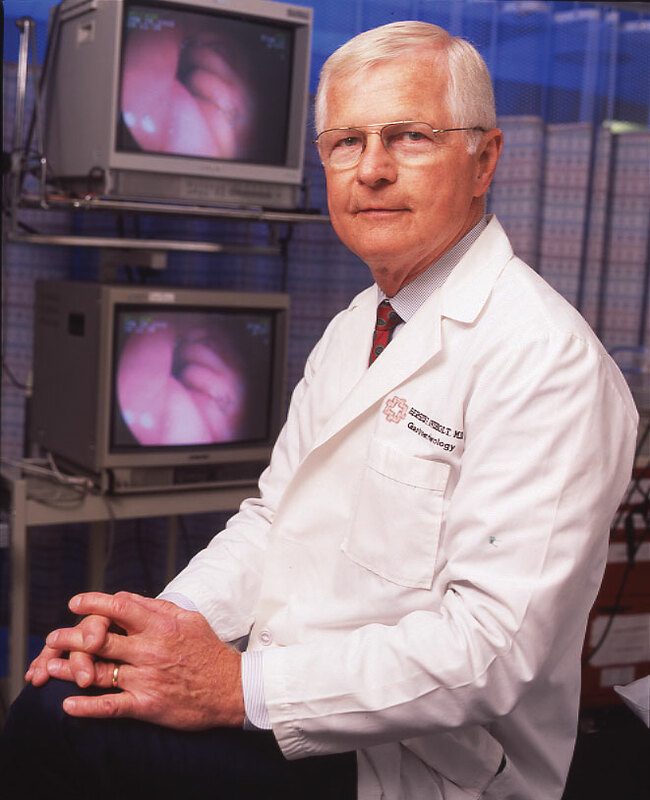 Dr. Overholt’s clinical and pre-clinical research in treatments for Barrett’s esophagus have been the pioneering work in the field. He is considered an international leader in the use of PDT and radiofrequency ablation for Barrett’s esophagus and has lectured and published extensively on the subject. He has served as President of the American Society for Gastrointestinal Endoscopy and the American Society of Outpatient Surgeons, and is a founding member and past President of the Tennessee Society for Gastrointestinal Endoscopy. He has served as Chief of Staff at St. Mary’s Medical Center, Knoxville. He is a past Trustee of the American Society of Internal Medicine. He has received numerous professional and civic awards including the distinction of being named Master by the American College and Physicians and the American College of Gastroenterology. Dr. Haydek is a gastroenterologist at Gastrointestinal Associates, P.C. (GIA) in Knoxville, and the current Medical Director of the Center of Excellence. He joined the Center in 1995 to focus on endoscopic treatments for Barrett’s esophagus and early stage esophageal cancer. 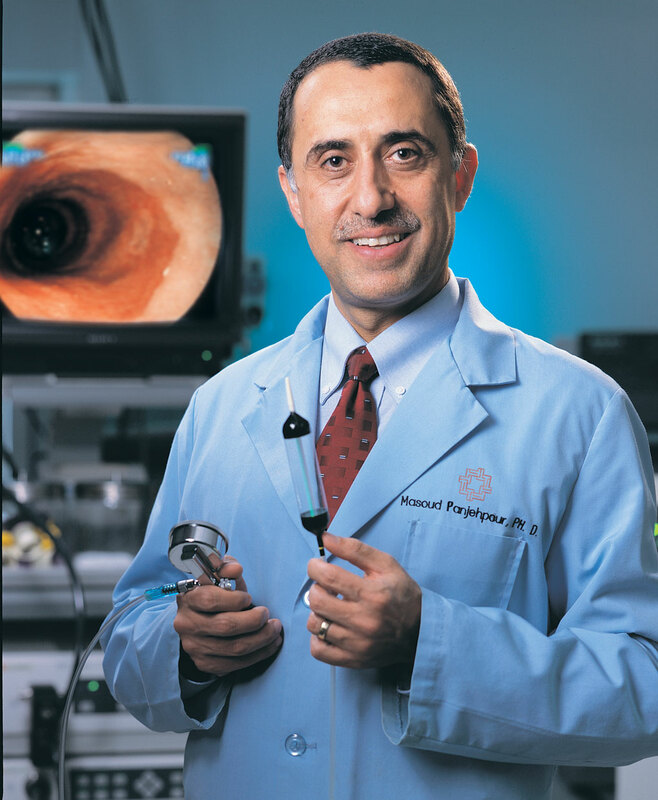 He has been a pioneer in application of new endoscopic treatments such as radiofrequency ablation using Through-the-Scope RFA catheter, HALO 360 Express catheter and a variety of Endoscopic Mucosal Resection techniques. Dr. Haydek is the Principal Investigator for several clinical studies for patients with Barrett’s Esophagus. Dr. Haydek received a degree in pharmacy from the University of Illinois. He subsequently obtained his M.D. degree and completed his internship, medical residency, chief residency and gastroenterology fellowship at Loyola University Medical Center in Chicago. Following his fellowship and prior to his relocation to Knoxville, Tennessee, Dr. Haydek worked for three years as an academic gastroenterologist and Assistant Professor of Medicine at Loyola University Medical Center and Hines VA Hospital in Chicago. Dr. Haydek’s accomplishments are extensive and include numerous research publications, multiple nominations for “Outstanding Teacher” awards and several “Top Physician” honors, both locally as well as nationally. 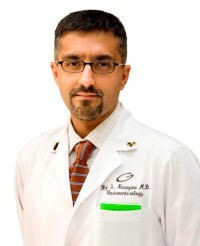 In addition, he has attained the distinction of being appointed a Fellow of the four major medical organizations including the American College of Physicians (FACP), the American College of Gastroenterology (FACG), the American Gastroenterological Association (AGAF) and the American Society for Gastrointestinal Endoscopy (FASGE). He has also served as Chief of the Medical Staff at Tennova (formerly Mercy Medical Center St. Mary’s), as Committee Chair of the Pharmacy and Therapeutics Committee and is dual board certified in both Internal Medicine and Gastroenterology. Dr. Narayani is a gastroenterologist at Gastrointestinal Associates, P.C. (GIA). He joined the Center in 2005 to focus on outpatient endoscopic treatments for patients with Barrett’s esophagus and early esophageal cancer. He has extensive experience is application of lasers, radiofrequency ablation techniques as well as endoscopic mucosal resection. He was one of the first physicians in the country to use HALO 360 Express and Through-the-scope RFA catheters for treatment of Barrett’s esophagus. Dr. Narayani obtained his undergraduate and medical degrees at Vanderbilt University. He completed his Internal Medicine Residency and Gastroenterology Fellowship at the San Antonio Uniformed Services Health Education Consortium in San Antonio, Texas. He then served as an academic Gastroenterologist at David Grant USAF Medical Center at Travis AFB, California for 4 years before joining GIA. His 10-year military career included an overseas deployment as a Critical Care Aeromedical Physician during Operation Enduring Freedom, and was further highlighted by earning a Meritorious Service Medal in 2005. Dr. Narayani has the distinction of being appointed a Fellow of the American College of Gastroenterology and the American Society for Gastrointestinal Endoscopy and a member of American Gastroenterological Association. Dr. Panjehpour is the Director of Research and Operations at the Laser Center. He is also a Research Associate Professor at the College of Veterinary Medicine and holds a visiting scientist appointment at Oak Ridge National Laboratory. His collaborative work with the College of Veterinary Medicine and Oak Ridge National Laboratory has resulted in several human clinical studies including development of balloon photodynamic therapy and non-invasive detection of cancer using laser induced fluorescence spectroscopy. He lectures extensively on PDT and has published numerous papers and book chapters. He is a member of the American Society for Laser Medicine and Surgery, American Society for Photobiology, the International Society for Optical Engineering (SPIE) and the American Gastroenterological Association. Dr. Panjehpour was the recipient of the Knoxville News Sentinel’s Health Care Heroes “Innovation” Award in 2013. Mr. Thomas, Mr. Riederer, and Ms. Abrams are the Laser Center nurses who coordinate the day-to-day care of our patients. They provide individualized nursing assessment, prepare patients for endoscopic procedures, as well as assist the physicians during endoscopies. They also ensure that patients receive the required pre-procedure education and post procedure follow-up calls. They are trained in moderate sedation care, are Advance Cardiac Life Support (ACLS) certified and are considered experts in the nursing care of Barret’s Patients. By teaming with Gastrointestinal Associates physicians and nurses we are able to provide excellent well-coordinated patient care. Ms. Whittaker is the Project Coordinator for the Laser Center. She is often the first person patients encounter when they call our Center to discuss their treatment options. She helps direct their questions to the appropriate support staff and handles mailing out packets of information, collects patient records from referring physicians, assists insurance staff in obtaining pre-certs, and assists patients and their families making their visit as pleasant as possible. She is responsible for registering patients. Ms. Raney and Ms. Summers both serve as part of the support team at Gastrointestinal Associates, P.C. They work in conjunction with the Laser Center staff to provide a well-coordinated day-to-day care for patients. They coordinate collection of patient records from referring physicians for review by the doctors and handle scheduling patients at GIA and the Laser Center. Ms. Karnes is the Quality Director and Clinical Research Coordinator at Gastrointestinal Associates, P.C. She has been the study coordinator for several studies for diagnosis and treatment of Barrett’s esophagus. She and her staff coordinate data collection and reporting for all studies conducted at GIA. Ms. Witt, Ms. Edwards and Mr. Ball work at the Fellowship Center, the free housing for out-of-town patients. They coordinate housing and transportation for patients coming to Knoxville for their treatments and follow-up endoscopies. Ms. Cook is the librarian at the Medical/Nursing Research Library, located on the 3rd floor of Thompson Cancer Survival center. She assists the medical staff in conducting searches for research articles in medical journals. Robert C. DeNovo, D.V.M., M.S., D.A.C.V.I.M. Dr. DeNovo is a Professor & Head of Department of the Small Animal Clinical Sciences at the College of Veterinary Medicine, University of Tennessee, and a Diplomate of the American College of Veterinary Medicine. He has been involved with the PDT program since 1989, when the preclinical research was initiated at the PDT Laboratory at the College of Veterinary Medicine. He has been instrumental in development of the animal studies and contributed to evaluation of light delivery devices currently in human use. Alfred M. Legendre, D.V.M., D.A.C.V.I.M. Dr. Legendre is a Professor of Medicine at the College of Veterinary Medicine at University of Tennessee. He is the chief of medical oncology at the small animal clinic. Dr. Legendre is a Diplomate of the American College of Veterinary Internal Medicine. He has been involved with veterinary application of lasers and PDT for treatment of client-owned animals at the small animal clinic.